Documents / 2019 CONNY Documents / 2019 Rules Documents / CONNY Rules Test Passed Lists. CONNY member program coaches and administrators are reminded that all CONNY coaches must pass the 2019 CONNY Online Rules Test for the gender they coach before coaching their first CONNY game. The girls and boys tests may be found under "TRAINING" in the top menu the CONNYlacrosse.org home page. WILTON CT – The Intercollegiate Men’s Lacrosse Coaches Association (IMCLA) has announced the Game of the Week matchup between #5 ranked University of Pennsylvania and University of Vermont Men's Lacrosse teams, which will take place on Saturday, April 27th at Wilton High School in CT with a game time of 1 P.M.
Head coaches from the respective colleges are enthusiastic about the game to be held in a neutral site at the heart of the lacrosse community in Connecticut. “Penn is really excited to be a part of the IMLCA Game of The Week. It provides great exposure for our program and it is a first-class event from a marketing and operations standpoint. We recruit extensively from the NY/CT area, and College Properties Group does everything in a first-class manner. We are excited to play Vermont in this event” said University of Pennsylvania Head Coach and IMLCA Vice President Mike Murphy. 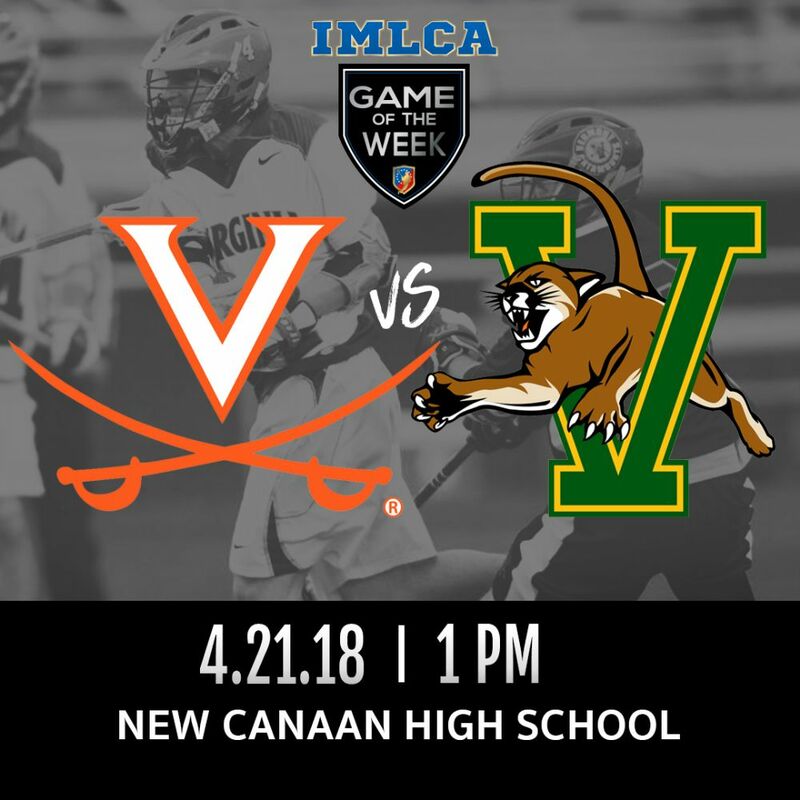 His thoughts were echoed by Chris Feifs, Head Coach of Vermont, “We thank the IMLCA for hosting us for the second straight year with the game of the week. We are thrilled for the opportunity to compete against the University of Pennsylvania in Wilton, CT; one of the strongest lacrosse communities in the country”. About IMLCA: The IMLCA was formed in 2004 to serve the intercollegiate men’s lacrosse coaches community. To develop among intercollegiate coaches a deep sense of responsibility in teaching, promotion, and maintaining the growth of lacrosse in accordance with the highest ideals of fair play. To stimulate the development of quality leadership for lacrosse programs by recognizing professional contributions to the sport and keeping members informed of current coaching techniques and trends. To identify and pursue issues relevant to lacrosse coaches and to the sport of lacrosse; and to provide a forum for the discussion of matters of interest to members of the Association. To promote cooperative efforts with other professional organizations interested in the development of lacrosse and athletics in general. iii.three (in girls games and four (4) coaches on each sideline in boys games. b.Girls – Transitional (formerly Full) Checking games require 2 adult referees - NOTE: Please keep HS Saturday Game schedules in Mind - Please look to schedule these games EARLIER/LATER in the day. Thank you all for your patience on this topic, the implications of Yale taking over the June 8-9th Weekend has severely impacted our end of season tournaments. Below are the scheduled Tournament dates for each level with their location. For 2019 there will be NO scheduled Lightning CONNY Tournament - Links will be published are for other local tournaments. Look to 2020 where we bring it back to celebrate 30 years of CONNY! The 2019 SENIOR & JUNIOR BOYS RULES of PLAY have been corrected to bring two safety related rules into alignment with US Lacrosse youth rules. The penalty for targeting in Rules 5.4-6&7 now includes mandatory ejection, changed from ejection at the discretion of the official. Slow-whistle Technique Rule 7.8-2 has been changed to add termination of a slow whistle when the ball hits the ground (not a shot). Direct any questions or comments to Jack Couch, 203-952-4661, . All CONNY coaches are reminded that they must pass the rules test for the gender they coach before they coach in a CONNY sanctioned contest. See here for the test. Boys rules comments - please contact Jack Couch at . 6) Only cancel games - never DELETE games as this creates issues of synchronization with the refereeing assignment sites. This should become the quickest way to keep you all informed about changes during Tournament season, and keep the Youth Lacrosse community connected all year. If you haven't already seen it, the following link will take you to a terrific documentary video about the origins, history, growth, and future of both men's and women's lacrosse. It is well worth the fifty-five minutes it runs. The documentary does, however, omit one fascinating detail. James Naismith, credited with inventing basketball while teaching at Springfield College, was a Canadian and a lacrosse player. Thus, it's not that lacrosse is a lot like basketball ... it's that basketball is a lot like lacrosse. To that end, we have created a "Concussions Resources" page on this website (on the left hand menu). This page is designed to assist your team, town, school, or league in creating a concussion awareness program. The resources available will also help parents and coaches with diagnosis and action when a player gets hit in the head. Thank you for addressing this highly relevant topic with your program coaches and parents.